I have real problems with the skin on my hands due to exposure to certain cleaning solutions, frequent hand washing, etc. My skin is really dry and sometimes it itches, cracks and peels. Therefore, I need a product that will provide my hands with moisture and protection from dryness. I won’t go into further detail on the problem here, but I do talk about it in another blog post. My hands are so dry that my 8-year old nephew laughed at me one day and said “ Auntie, your hands look like granddaddy’s”. His mom (whom happens to be my sister) noticed how dry and wrinkled my hands looked and she recommended a product called Aquaphor Healing Ointment. She told me that when her son was an infant, he had eczema really bad. His eczema was so bad that he would scratch his skin until it was red and raw. She said Aquaphor was the only product that was effective against her son’s eczema. I don’t have eczema. 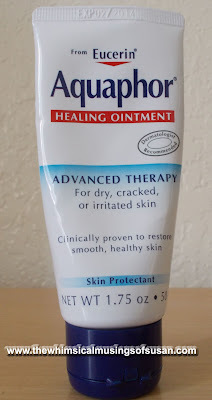 At the same time, I figured that since Aquaphor Healing Ointment is dermatologist recommended, it wouldn’t hurt me to try the product. Aquaphor Healing Ointment is manufactured by Beiersdorf, Inc. which also makes Eucerin lotions and creams. I purchased a small tube of it for about $6.50 at CVS (minus discounts). I purchased it in the flexible 1.75 oz. size tube, which I like very well. It is small enough to carry around in a purse or pocket. The lotion itself is odorless, very thick and greasy. It contains 41% petrolatum and this explains the greasy consistency. The first time that I used Aquaphor Healing Ointment, my hands definitely felt and looked better immediately. The itching stopped right away and my hands looked smoother. After a few days of using it, the skin on my hands looked almost completely restored to normal. So yes, the product really works, but I have some issues with it. For one, it is too expensive. I don’t understand why a product that is 41% petroleum jelly should cost so much. I mean, why not just use plain Vaseline (100% petrolatum) on top of some good lotion? This would be much more economical. There is no other ingredient in the product that justifies the higher cost, either. Another thing that I dislike about Aquaphor is the greasiness of it. My skin looks really shiny and greasy when I wear it. So, I do not tend to use it during the day, while I am at work or on the go. I use it mainly at night while I am sleeping. I prefer to rub it on my hands just before bed. Then, I put on a pair of Essence of Beauty spa gloves. This locks in the moisture and protects my bedding and night clothes from the grease. During the day I use other creams and lotions to keep my hands moisturized. My final conclusion about Aquaphor Healing Ointment is that it does work, but it is too expensive. I won’t buy it again unless I can get it at a much lower price. Also, I plan to try Vaseline to see how much I would like it compared to Aquaphor. For more information or to ask questions about this product, call 1-800-227-4703.